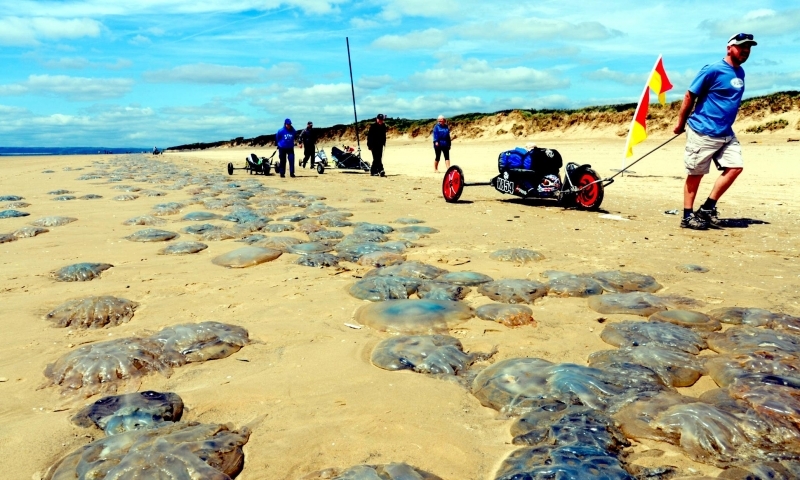 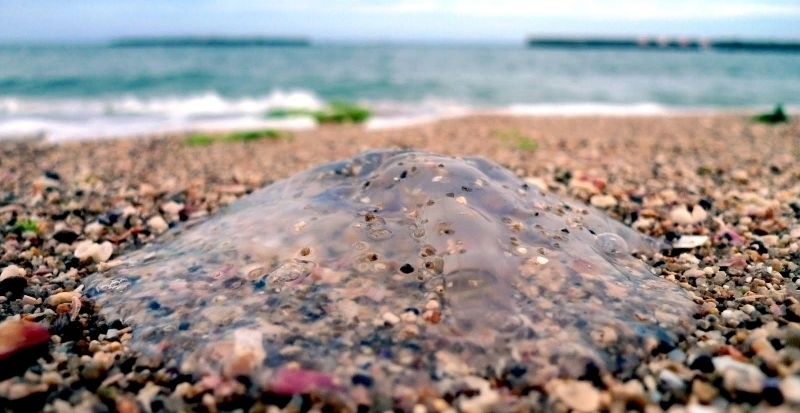 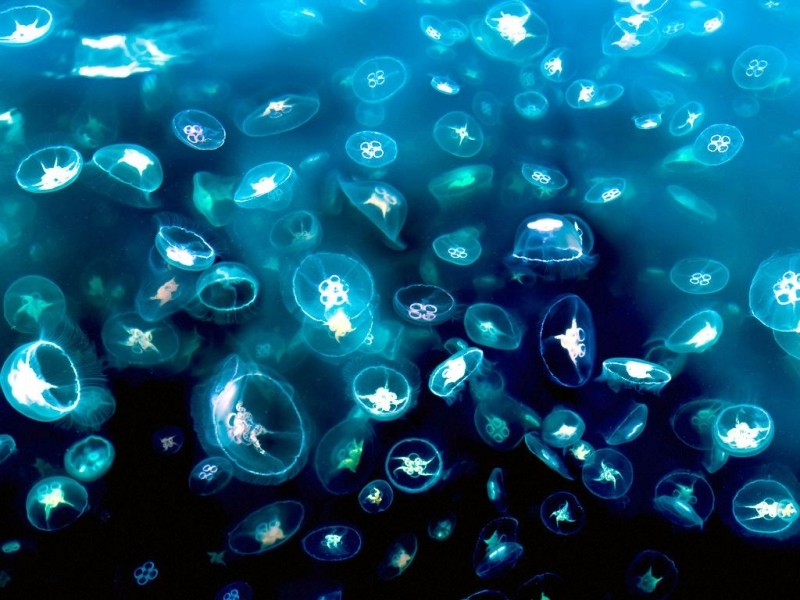 Right from the start, the proper scientific name for these animals is “Sea Jelly” not “Jellyfish”. 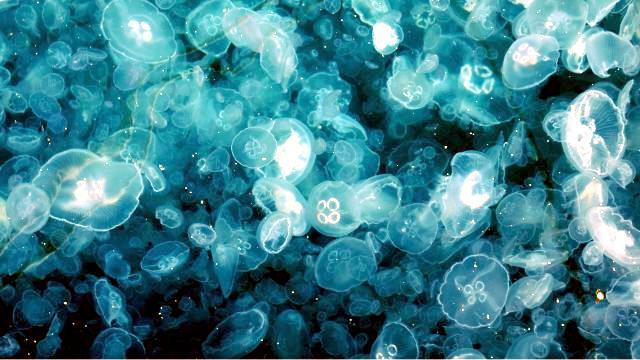 They are invertebrates and not a fish nor do they have a backbone. 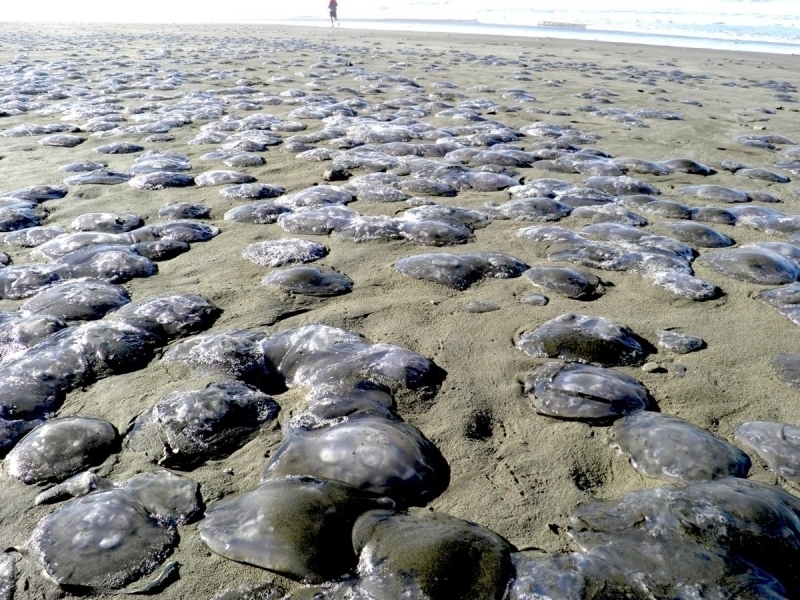 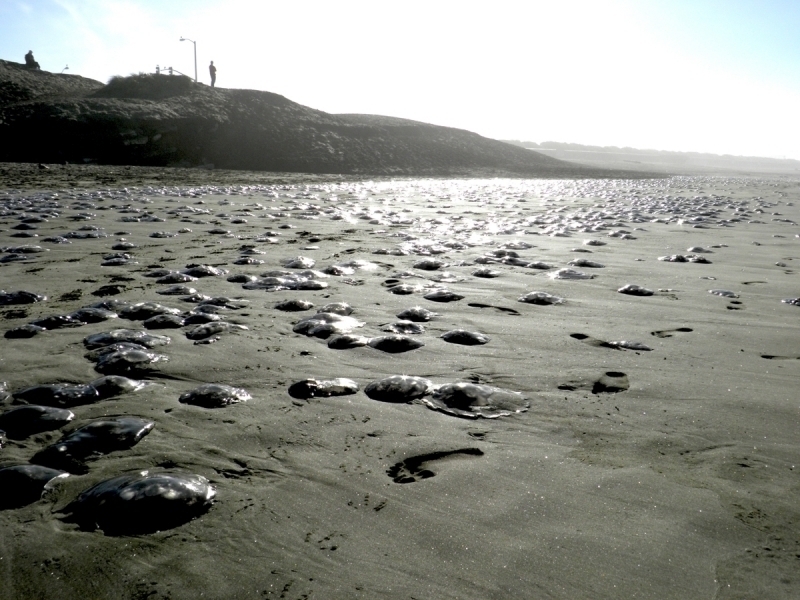 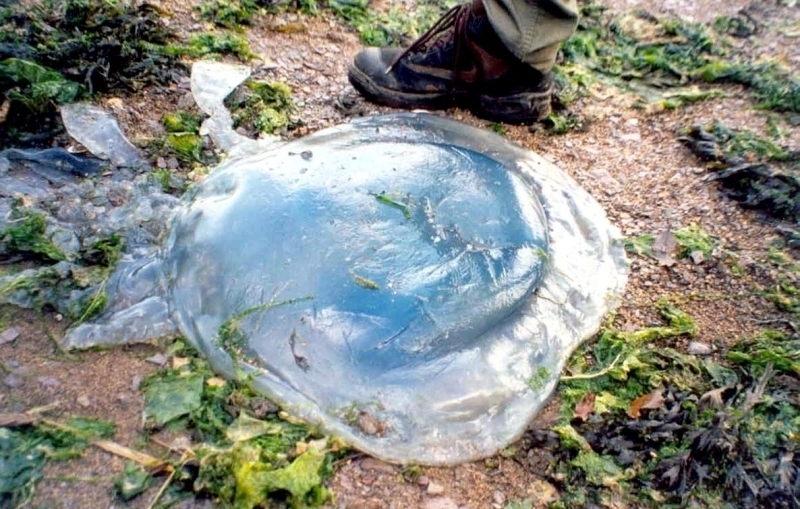 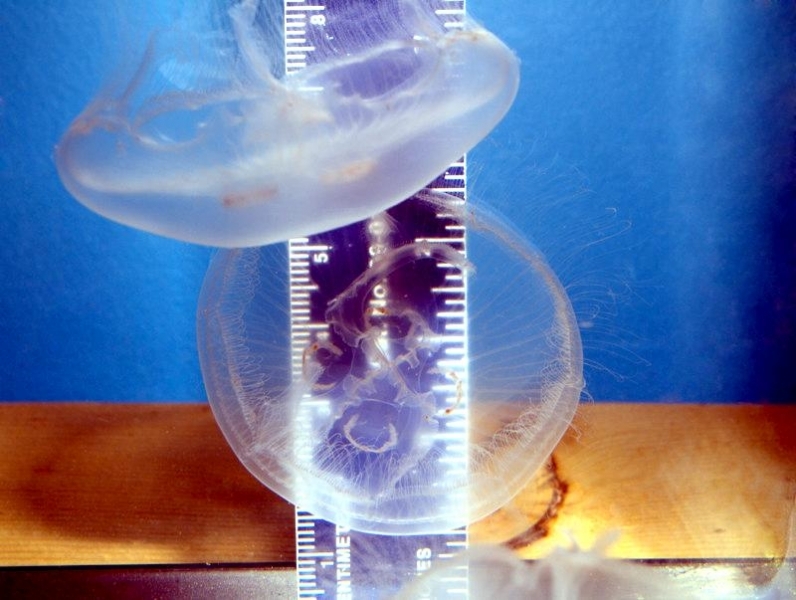 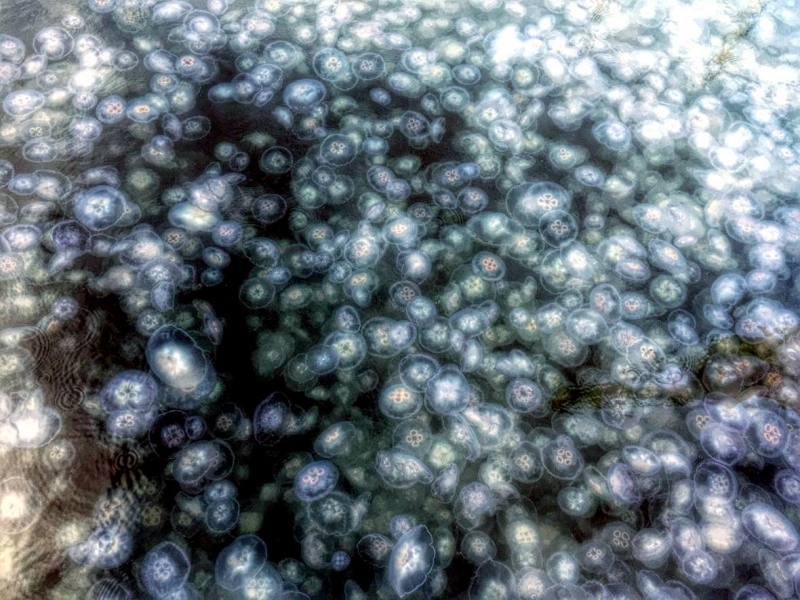 Moon Sea Jellies range between 5-40 centimeters in diameter. 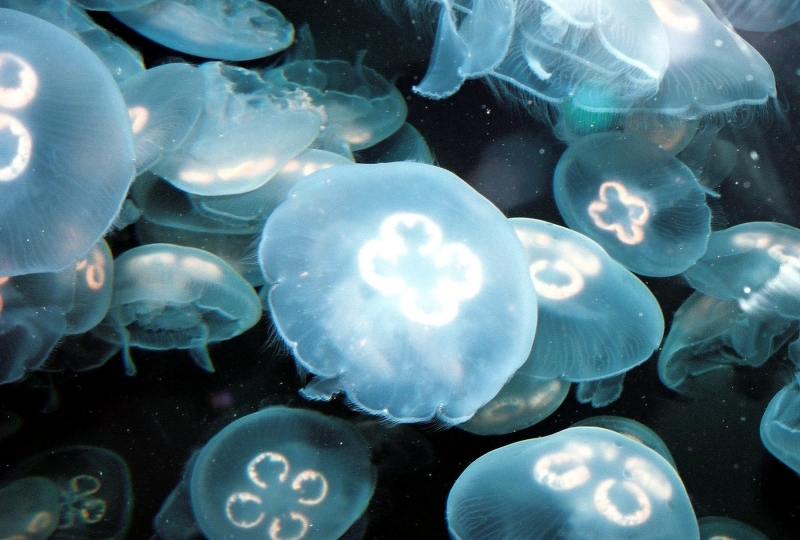 They can be recognized by their delicate and exquisite coloration, often in patterns of spots & streaks. 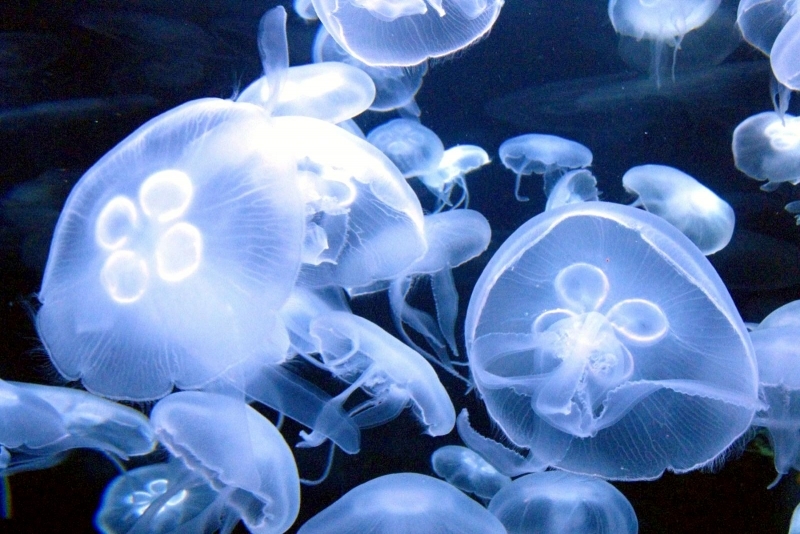 Their behavior depends on a number of external conditions in particular, food supply. 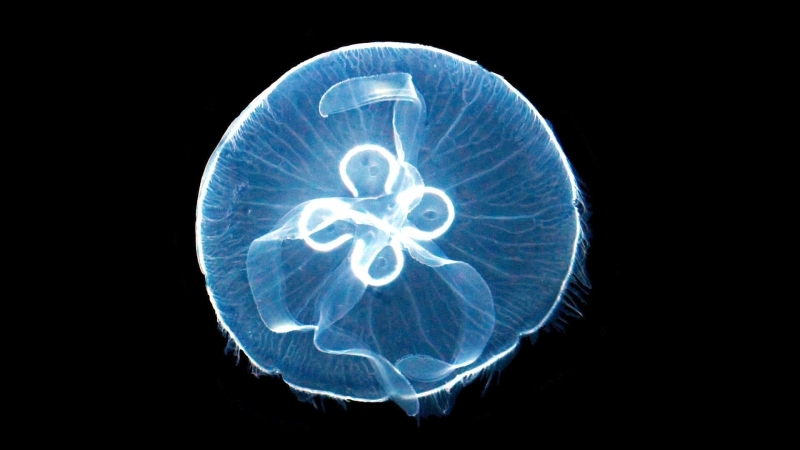 Moon Sea Jellies swim by pulsations of the bell-shaped upper part of the animal. 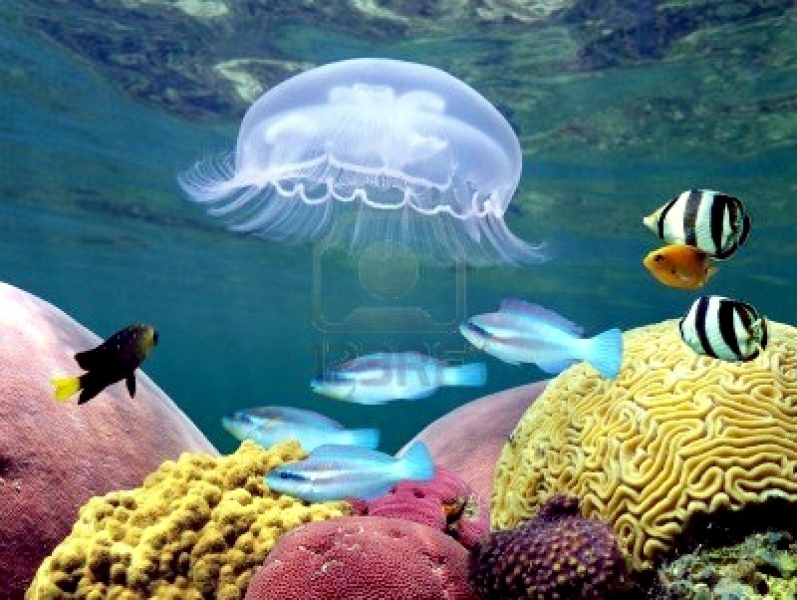 Swimming mostly functions to keep the animal near the surface of the water rather than to make progress through the water. 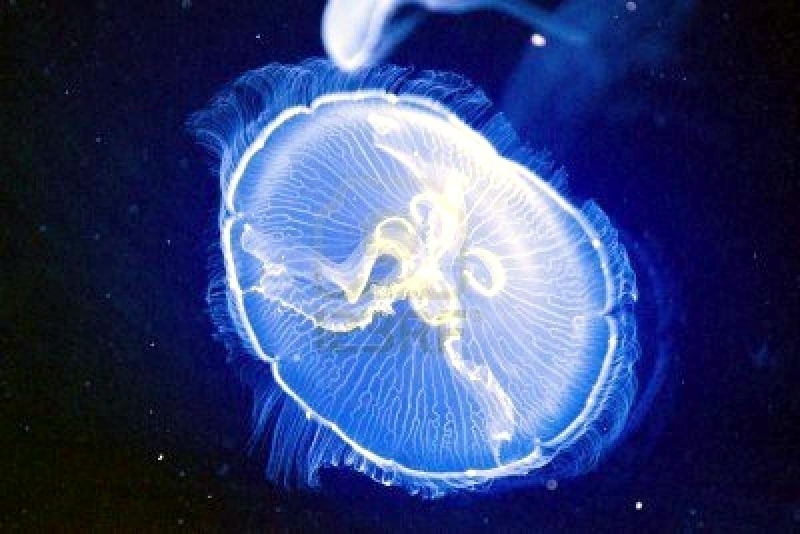 They swim horizontally, keeping the bell near the surface at all times. 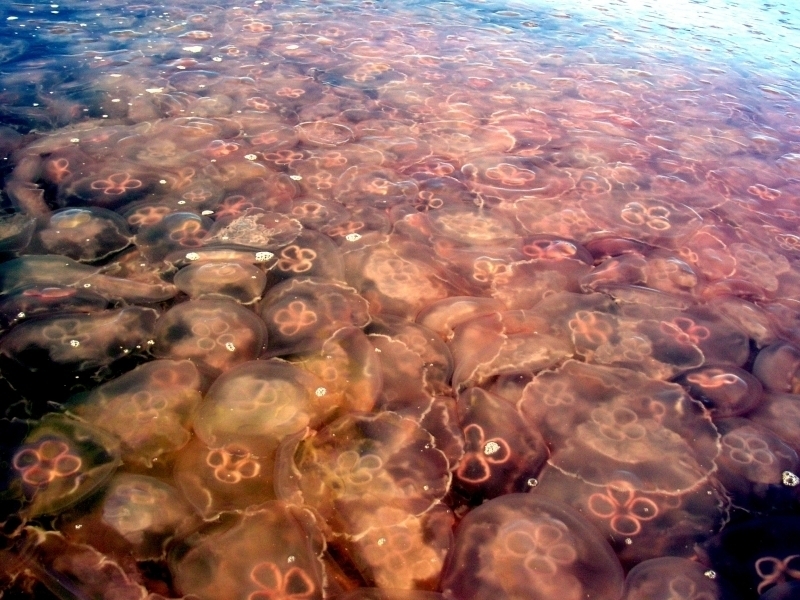 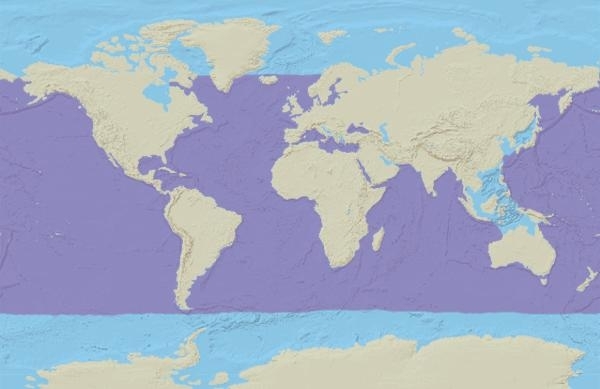 This allows the tentacles to be spread over the largest possible area, in order to better catch food. 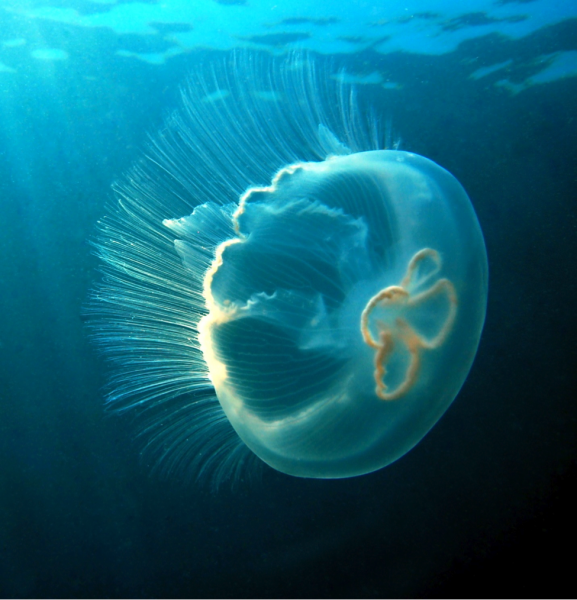 The coronal muscle allows the animal to pulsate in order to move. 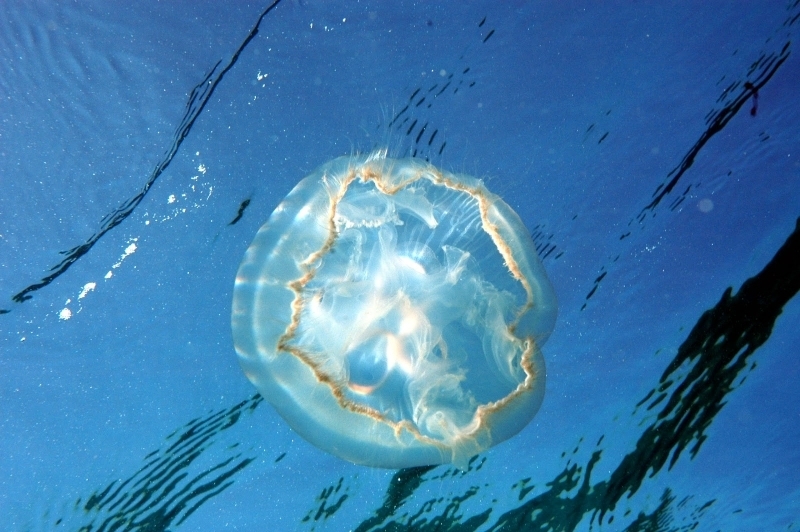 Impulses to contract are sent by way of the subumbrellar nerve net and are nervous in origin. 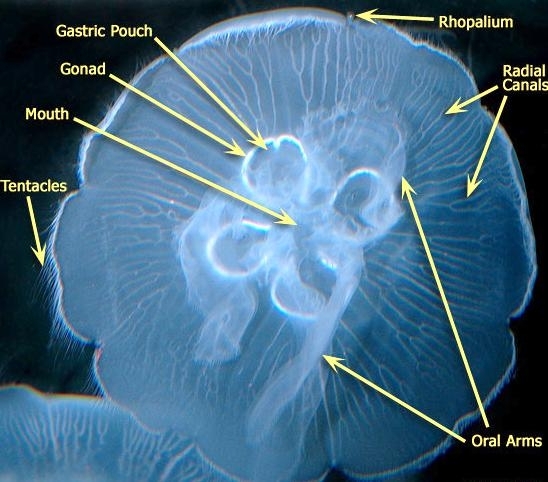 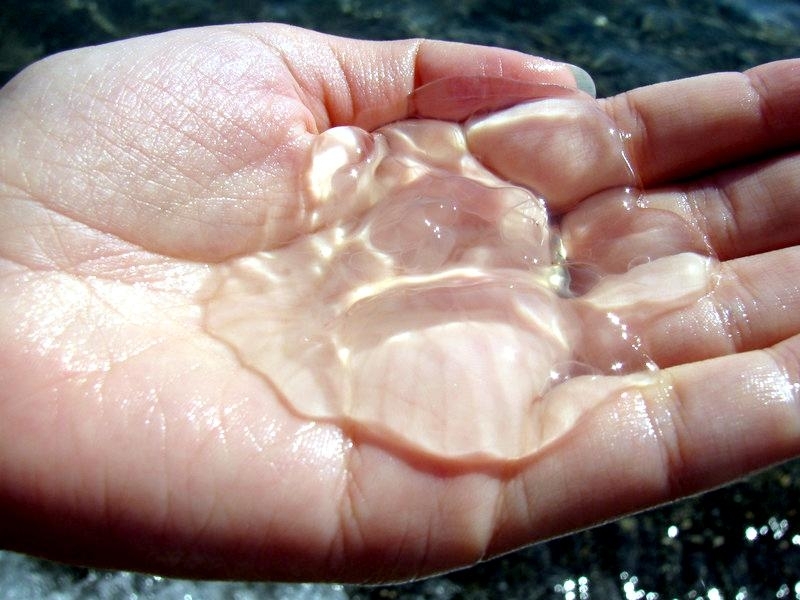 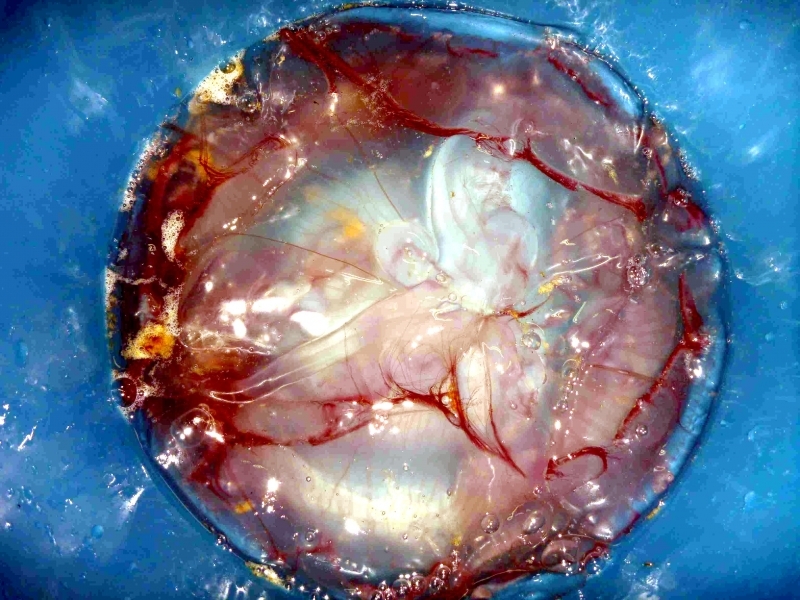 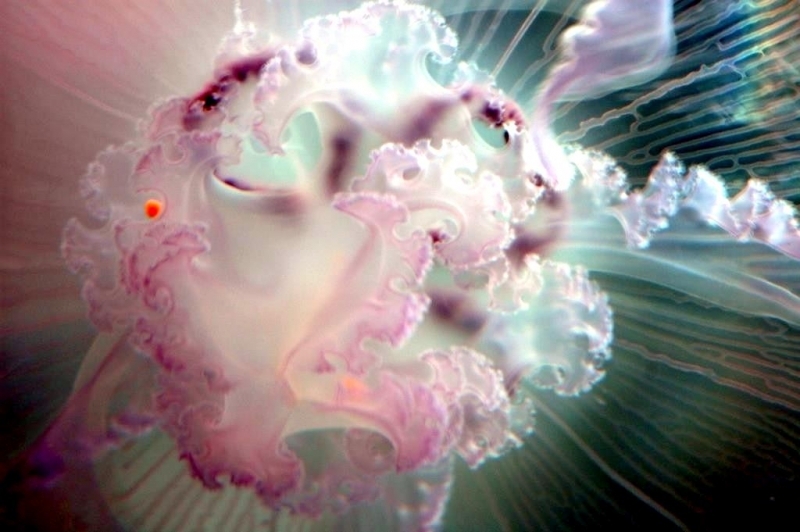 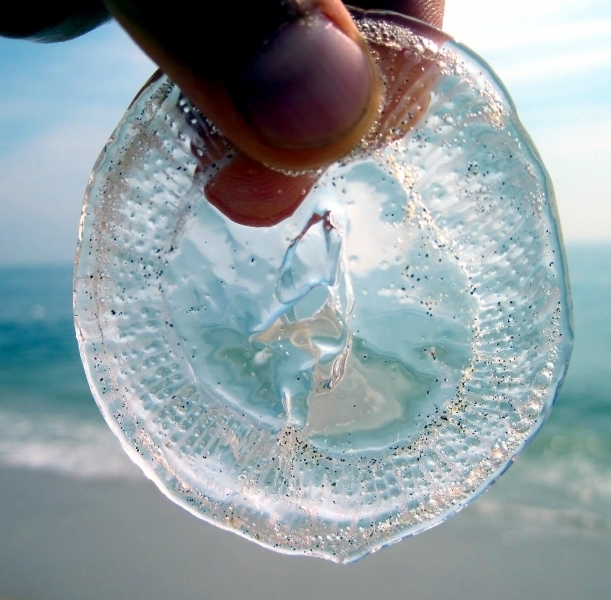 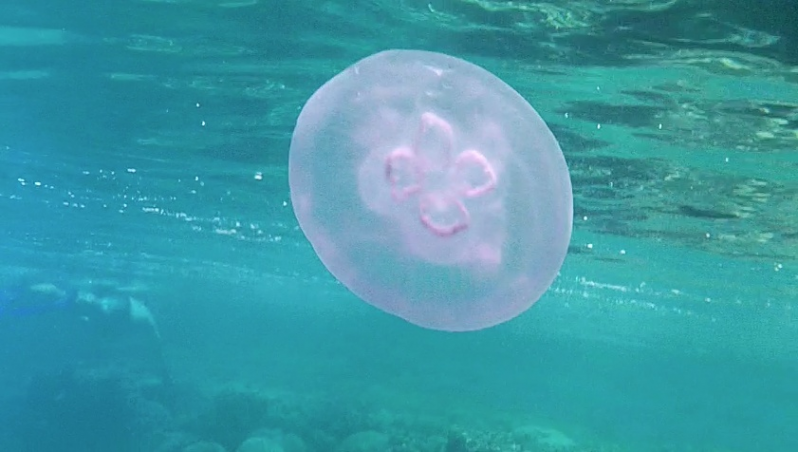 The Moon Sea Jelly has rhopalial centers, which allow it to control the pulsations. 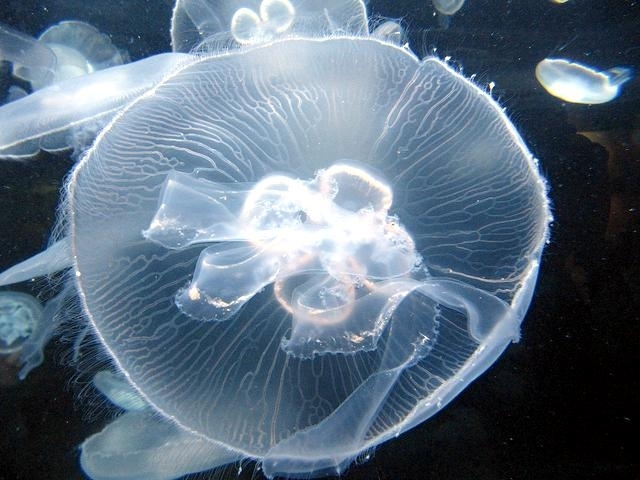 As the oxygen rate in the water goes down, so too does the respiratory rate of the Moon Sea Jelly. 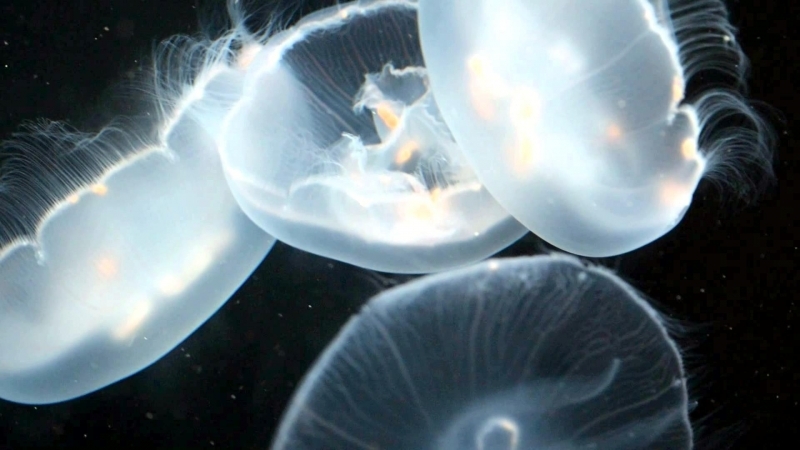 They are found near the coast, in mostly warm & tropical waters worldwide but they can withstand temperatures as low as -6 °C and as high as 31 °C. 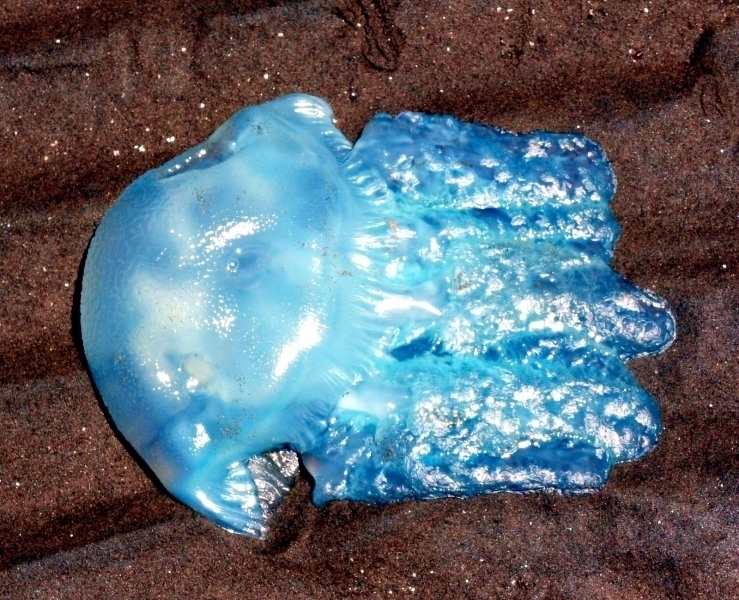 They are prevalent in both inshore seas & oceans. 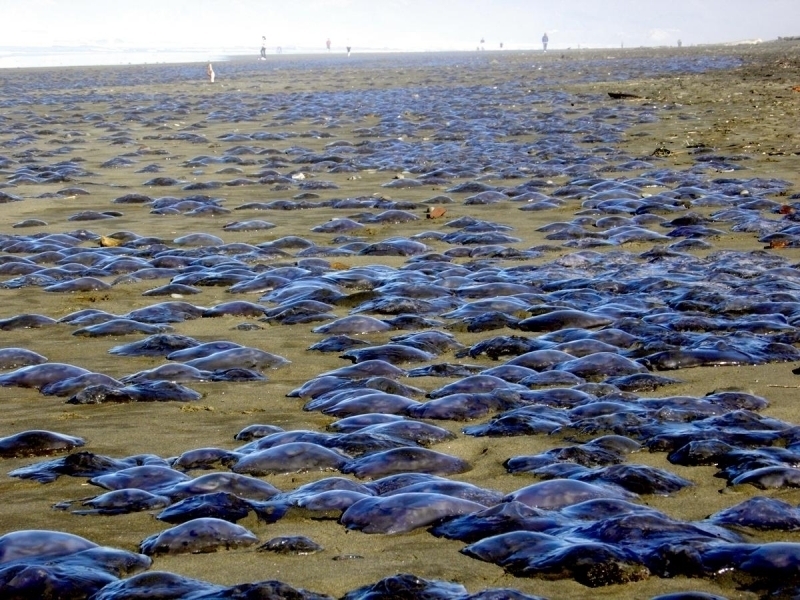 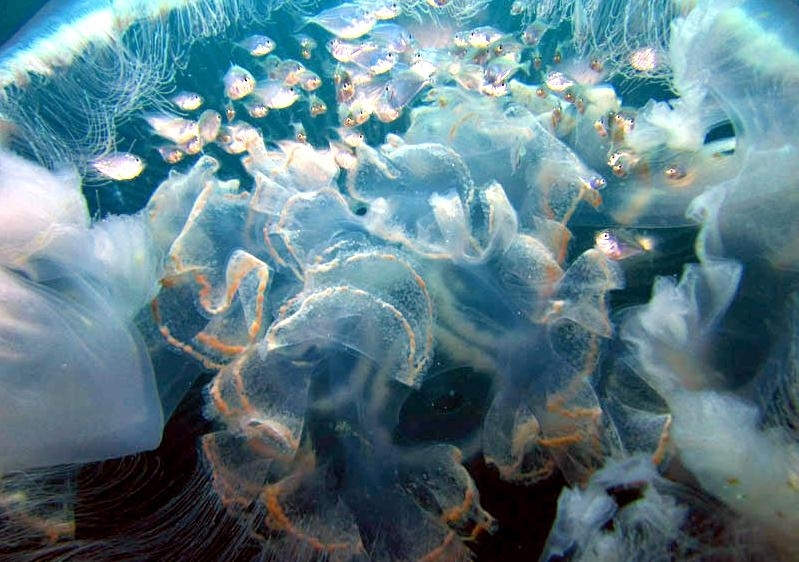 Their habitat includes the coastal waters of all zones and they occur in huge numbers. 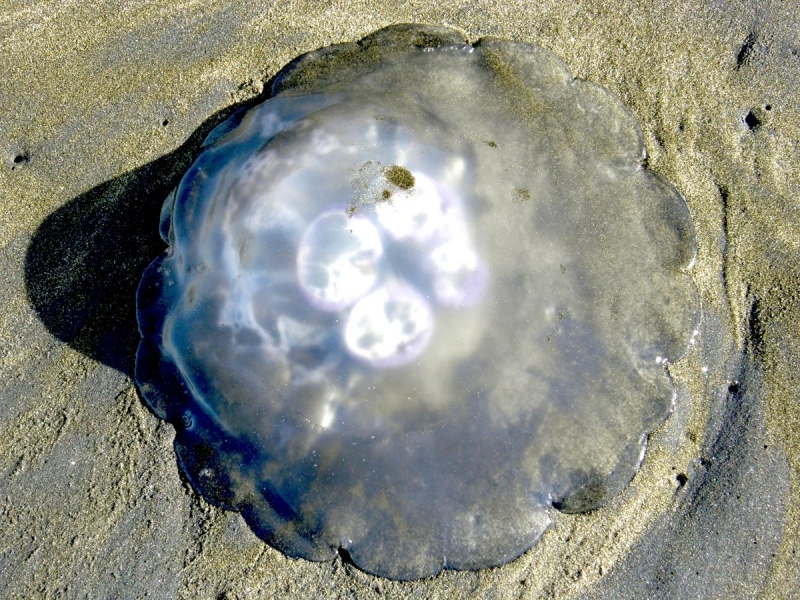 They are known to live in brackish waters with as low a salt content as 0.6%. 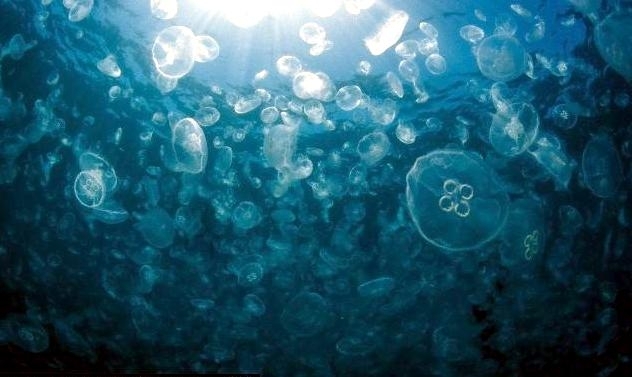 Decreased salinity in the water diminishes the bell curvature and vice versa. 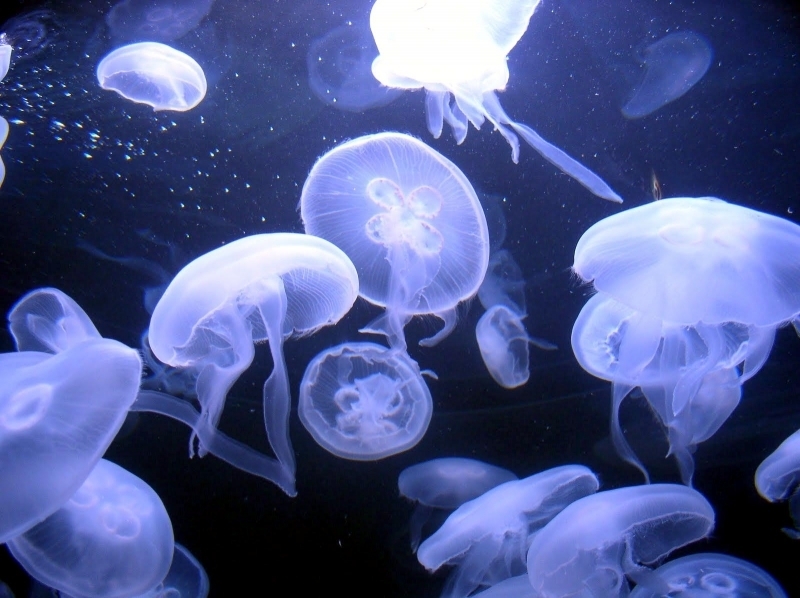 An optimum temperature for the animals is 9-19 °C. 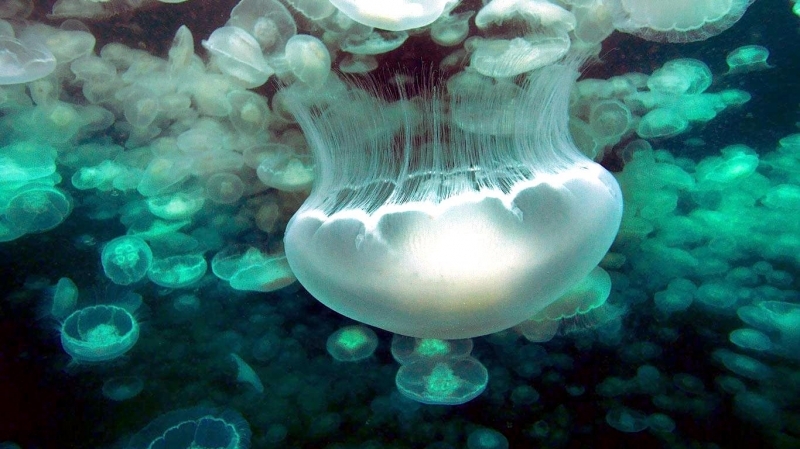 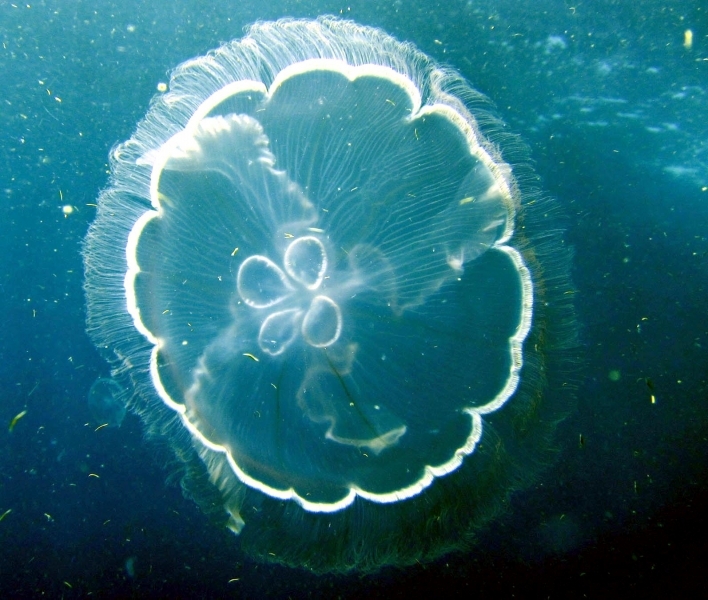 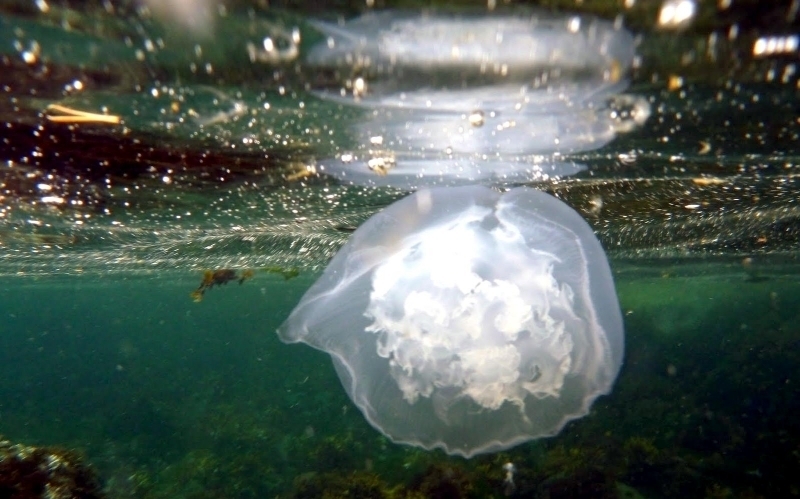 The Moon Sea Jelly is carnivorous and feeds on zooplankton. 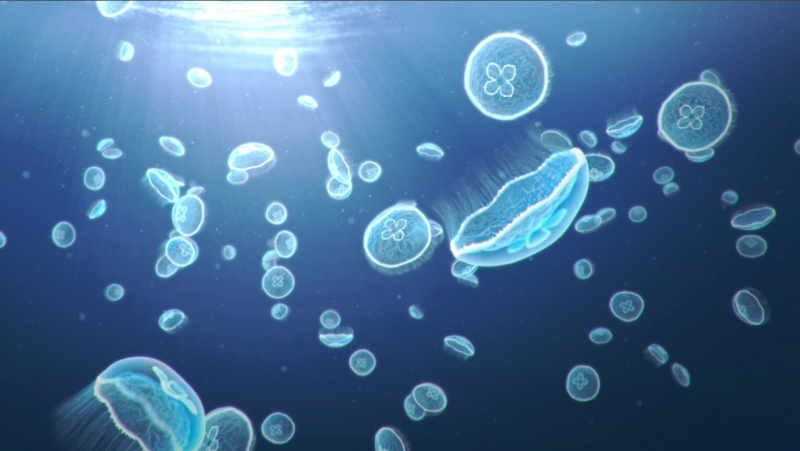 Their primary foods include small plankton organisms such as mollusks, crustaceans, tunicate larvae, copepods, rotifers, nematodes, young polychaetes, protozoans, diatoms and eggs. 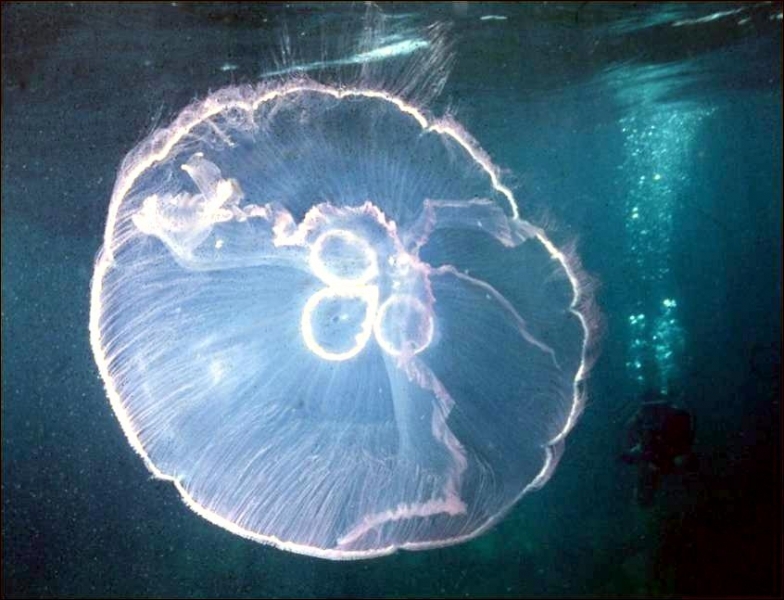 They have also been observed eating small hydromedusae & ctenophores. 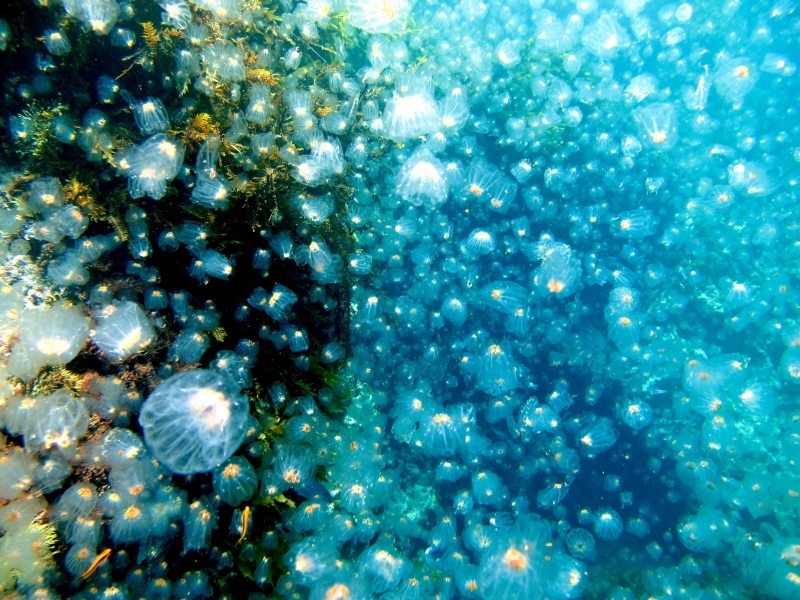 These foods collect chiefly on the surface of the animal, where they become entangled in mucus. 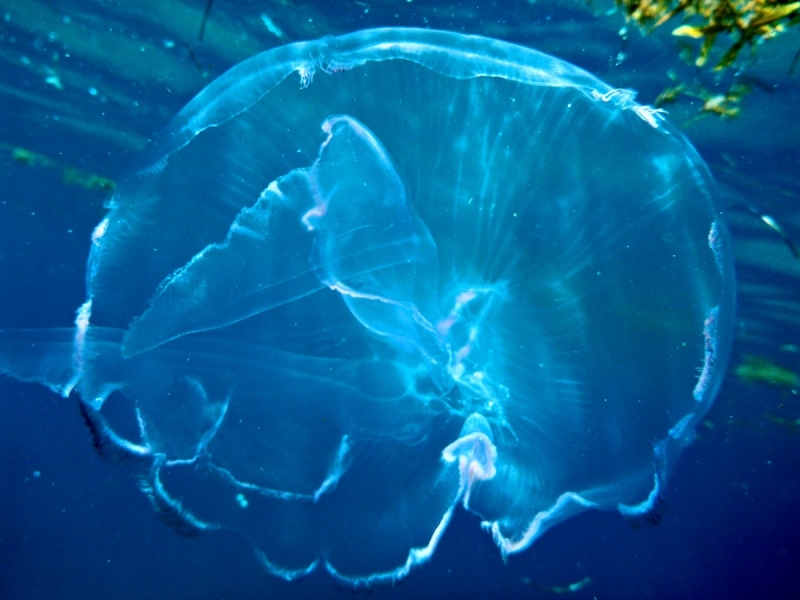 Food items are then passed on to the margins by flagellar action, where they collect on the lappets. 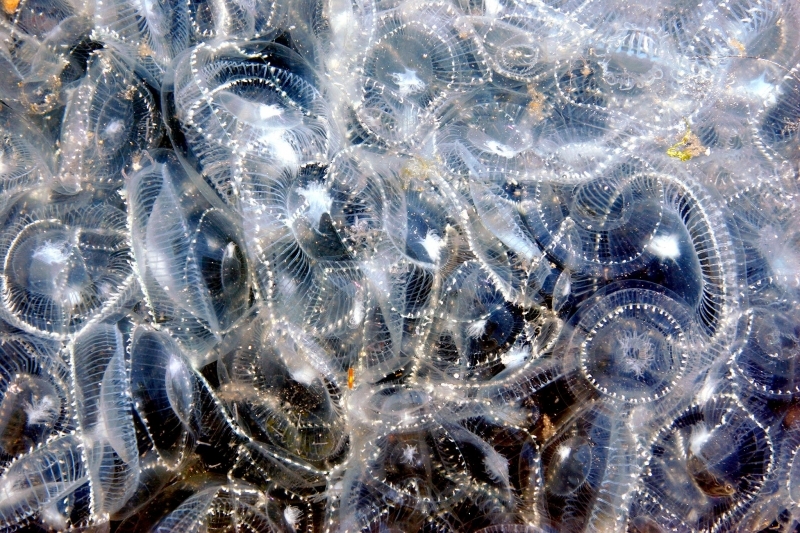 They are then moved again by flagellar currents, along 8 separate canals which are unique to this species of sea jellies. 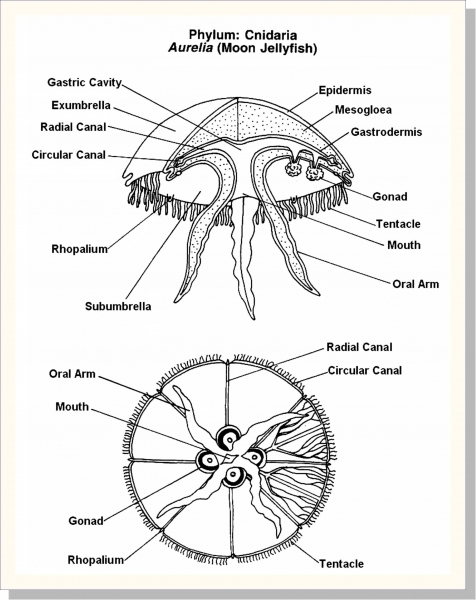 These canals branch off and run into the stomach. 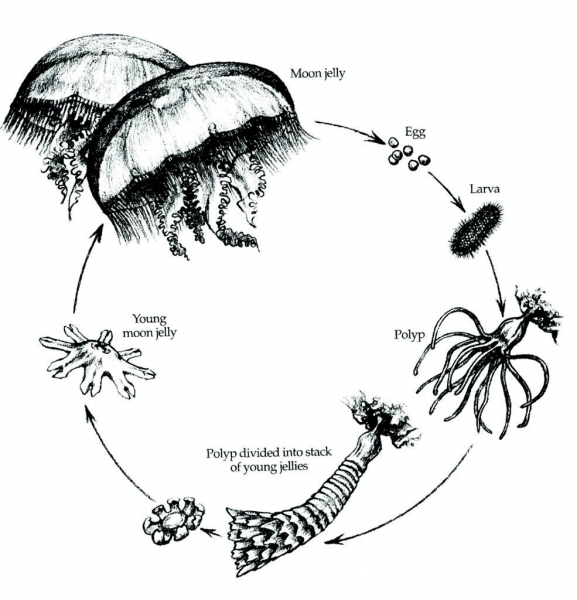 Sexual maturity in Moon Sea Jellies commonly occurs in the spring & summer. 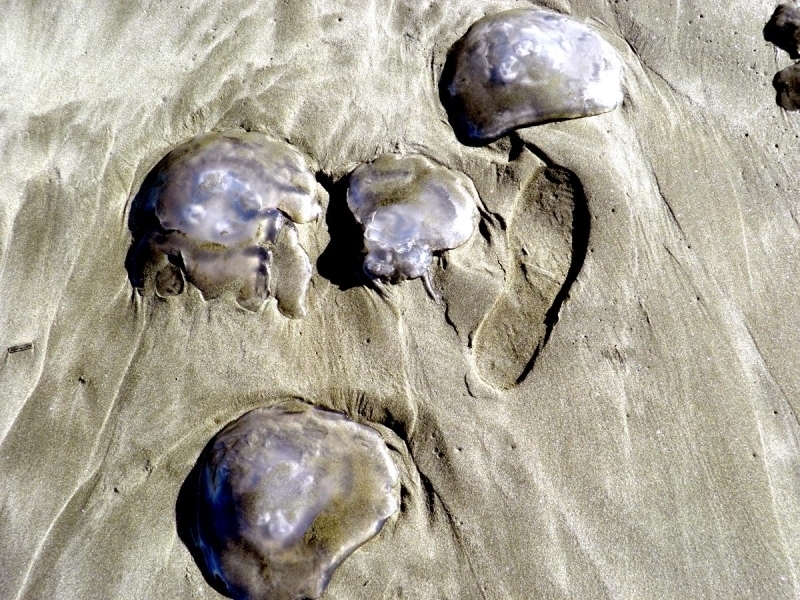 Their eggs develop in gonads located in pockets formed by the frills of the oral arms. 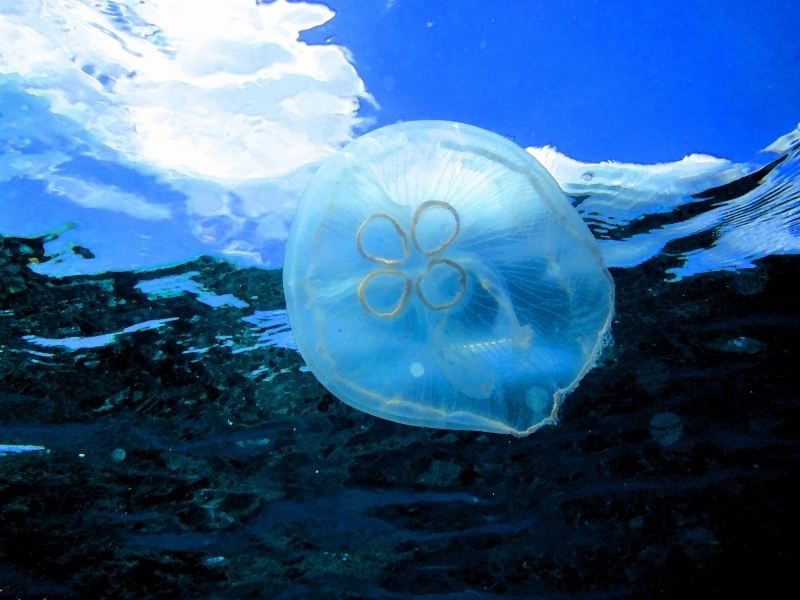 Their gonads are commonly the most recognizable part of the animal, because of their deep and conspicuous coloration. 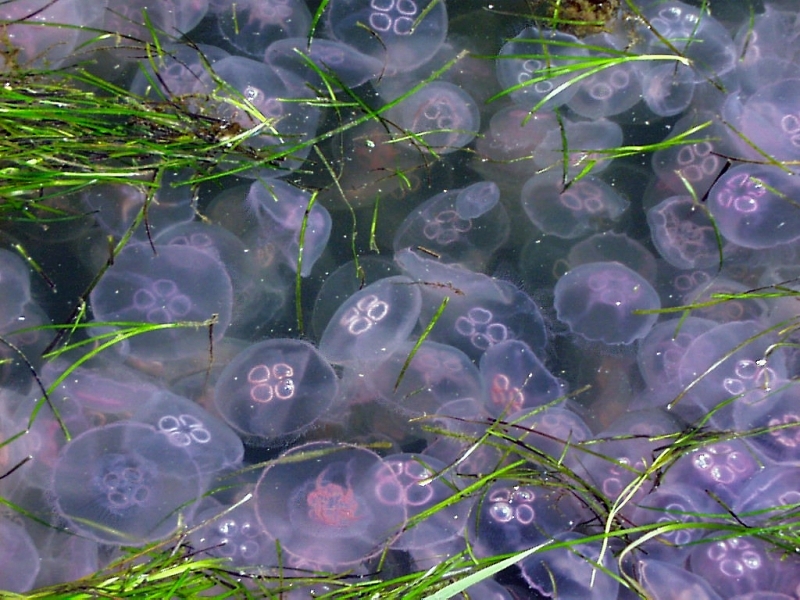 Their gonads lie near the bottom of the stomach. 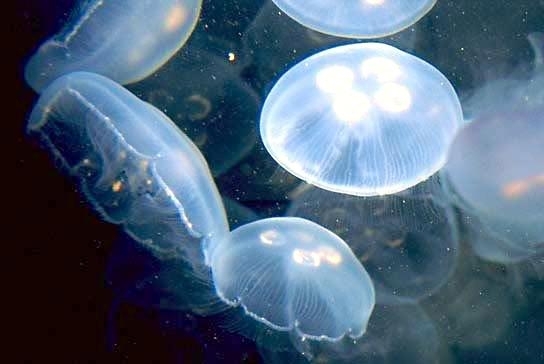 Males & females are distinct and reproduction is sexual.